I, too, enjoy the quail and fortunately they are daily visitors in my garden. Great close ups of a real beauty Pat. Boom & Gary of the Vermilon River, Canada. That quail is your signature bird. Always works for you it seems. What a beautiful subject Pat and as you point out the soft light and sky really worked to your advantage. I'm always learning from you. You are the first person I have heard getting charged by a gopher. I wonder, do they bury their victims? Hey, when are we going to see some Yosemite landscapes? Those shots are AMAZING! And what a bird!! Thanks, Martha! 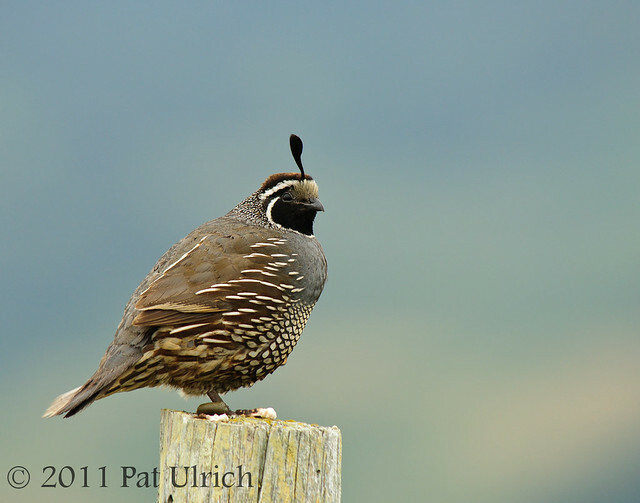 How wonderful to have quail visiting your property daily! Thanks, Joco! I do love these birds, and thankfully they've been pretty good to me when I see them. And thanks for giving me a new word of the day -- I've never heard louring before! Thanks, Springman! Soft overcast light is my favorite for wildlife photography (especially when it involves purple clouds before a rain system moves through). Not only does it help bring out the details without all of that extra contrast, but it means that without shadows you can shoot wildlife from any direction. And lol about the gophers burying their victims -- it seems likely though ;-) I posted a few landscapes right after I got back, but there are many more than need processing! I have a bad habit of focusing on my most recent images, so I need to find some time to go through the rest of my Yosemite trip, since there are at least a few more compositions that I was excited about. Thanks, Esther! They are a marvelous bird to photograph with their intricate plumage patterns and that great head-bob! Sir Francis Drake Blvd. seems like an appropriate place to find them with their plume like head-bob that makes them appear like royalty! Such beautiful markings on these birds Pat. No wonder they are one of your favourites. Great photos!! 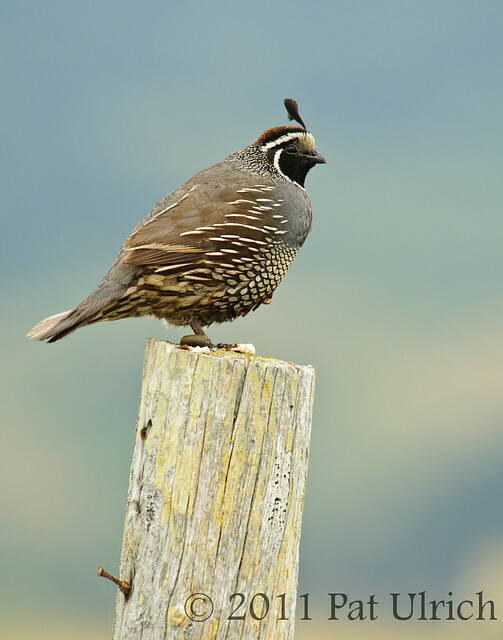 I never seen a quail in real but I can see why its a favorite,it so beautiful! STUNNING--these fellows always remind me of a fancy dancer ready to preform with all the finery!! Fabulous captures of the Quail! They are such beautiful birds. Great photos of the Quail and the sky background is beautiful too. Such a beautiful bird tob see...your images are stunning. Great photos of the Quail. They are neat looking birds. I would love to see one. Brilliant photos Pat. The markings on those Quail are just exquisite. They are striking birds and your photos are excellent! Beautiful bird and great shots. Perfect! Pat. Enjoyed your account and super shots of one of your favourite birds and I can see why. 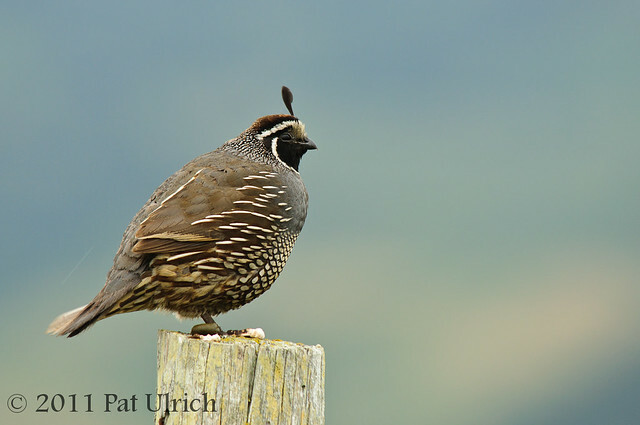 Californian Quail are certainly a striking and handsome looking bird. Well done and keep up the good work. Very handsome bird, beautiful colors, beautiful intricate design! If I was a female quail he would have my heart. Great pics! I do understand why it is your favourite bird. Perfect pictures, all of them! Beautiful images Pat. The background colors are fantastic. Thanks, Carletta! It is a bit like wearing a crown, isn't it? Thanks, HoldingMoments! I'm always amazed at the detail and variety of their patterns. Thanks, Fjällripan! They are a delightful bird to spend some time with, especially if they spend some time singing. Thanks, Sondra! They could certainly put on a good show with those costumes! Thanks, Mick! The background in this shot was actually a hillside that was quite a distance away, and with the purple rainclouds in the sky it came out with these great colors. Thanks, Andrew! I'm glad you enjoyed them! Thanks, Brian! There's just something about these birds that I love. Thanks, Jim! That awesome overcast sky that day made for some beautiful colors in the landscape! Gorgeous images. I've seen these in central Oregon before hiding in some juniper bushes.